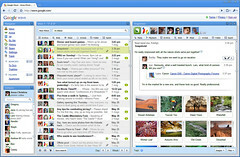 Google Wave is a new model for communication and collaboration on the web. The biggest problem it solves is that you no longer have to reply to someone by saying “See comments inline” copying and pasting the email body and responding to specific points in the conversation. Wave allows you to respond within the original message itself while maintaining the context. Users can reply anywhere in the message, edit the content and add others. It also allows replying to the other’s replies. Additionally, replies/edits are seen real-time, letter by letter, as they are typed so besides email it can also be used for instant messaging and real-time collaboration. Oh, and you can also “playback” the thread to check the order which it was edited, and who edited/modified what and when. Pretty neat stuff. The obvious next step is to incorporate it in the Blog Commenting System. WordPress, hope you’re listening… beat Blogger to the punch, after all, it’s open source. This entry was posted in Email, Technology, User Experience and tagged Email, Google, wave. Bookmark the permalink. and beneficial! In todays world that is really hard to deliver. Mobility, Usability and other Musings” Window Coverings was indeed a very excellent blog post, .